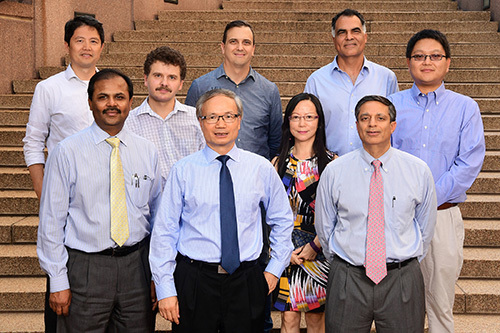 The Emory Molecular Interaction Center for Functional Genomics (MicFG) includes (L-R) Wei Zhou, Suresh Ramalingam, Andrei Ivanov, Haian Fu, Lee Cooper, Yuhong Du, Carlos S. Moreno, Sagar Lonial, and Xiulei Mo. Not pictured: Taofeek Owonikoko. A research team led by Haian Fu, PhD, within the cancer genomics center at Emory University and Winship Cancer Institute, has been selected by the National Cancer Institute (NCI) to participate in an elite national network focused on discovery of new cancer targets and precision cancer therapies. The Emory Molecular Interaction Center for Functional Genomics (MicFG) will be funded by a $4.52 million grant over five years. It is one of 12 centers designated for the NCI's Cancer Target Discovery and Development (CTD2) Network. Emory was first chosen by the NCI for its CTD2 Network in 2012. The CTD2 initiative was established to advance the knowledge of cancer etiology and mechanisms, and to potentially accelerate the development of therapeutic targets for precision oncology using computational and functional genomic approaches. The Emory CTD2 Center will focus on networks of protein-protein interactions created by mutated residues in oncogenes and tumor suppressors found in patient tumors. These unique protein-protein interactions could become tumor-specific targets for cancer drug development. "The interaction interfaces between proteins in specific tumor types have become a promising new focus area for cancer functional genomics studies and drug discovery," says Emory CTD2 principal investigator and MicFG leader Haian Fu, PhD. "Increasing efforts in large scale genomic studies across tumor types have revealed both frequent and rare mutations that are directly associated with cancer, offering new opportunities to target oncogenic genes at a much higher resolution today. Our new designation will allow us to leverage these new developments and sharply focus on cancer-driven mutations to develop possible therapies for those once considered 'undruggables.'" Fu is Winship Partner in Research Endowed Chair, professor and chair of pharmacology, professor of hematology and medical oncology, and associate dean for innovation and international strategies at Emory University School of Medicine. He also directs the Emory Chemical Biology Discovery Center and he serves as leader of Winship's Discovery & Developmental Therapeutics Program. Co-investigators are Winship Cancer Institute physician scientists Suresh Ramalingam, MD; Sagar Lonial, MD; Taofeek Owonikoko, MD, PhD; genomics and bioinformatics experts Wei Zhou, PhD, Carlos S. Moreno, PhD, and Lee Cooper, PhD; and systems and chemical biologists Yuhong Du, PhD, Xiulei Mo, PhD, and Andrei Ivanov, PhD. Although large amounts of data have been generated for genomic alterations in cancer, scientists face mounting challenges in translating these data into precision drug therapies. The Emory team will use powerful high-throughput screening technology, housed in the Emory Chemical Biology Discovery Center, to generate cancer-specific protein-protein interaction data. The bioinformatics team will analyze and integrate these data with genomic and clinical information for target prioritization and for public data sharing. The physician team will help provide disease insights to link genomic alterations with patient populations of specific tumor types for personalized medicine. "The identification of tumor-mutation mediated protein-protein interactions from this study may lead to the discovery of an entirely novel class of anticancer drugs for our patients", says Ramalingam, co-leader of MicFG and deputy director of the Winship Cancer Institute. As an example of their discoveries in the first MicFG cycle, Fu and his colleagues mapped the vast spider web of interactions between proteins in lung cancer cells, leading to new information about specific links between tumor suppressor genes, protein networks, and sensitivity to an FDA-approved drug now being tested in a clinical trial for non-small cell lung cancers. These PPI network data have been deposited in the NCI-hosted Data Portal for public sharing. In ongoing research, the team aims to establish high resolution oncogenic PPI maps; systematically apply informatics pipelines to discovery of promising PPI drug targets guided by genomic precision; and identify chemical probes that could disrupt these vital PPI pathways in tumors to advance therapeutic discovery and development. The NCI CTD2 Network emphasizes cross-Network collaborations and public data sharing for synergistic discoveries to maximize the impact of the Network. Other centers in the CTD2 Network include research teams from Harvard/MIT's Broad Institute, Columbia University, Dana Farber Cancer Institute, Fred Hutchinson Cancer Research Center, Johns Hopkins University, Oregon Health & Science University, Stanford University, University of California San Diego, two teams from University of California San Francisco, and University of Texas MD Anderson Cancer Center.